PT Distinction | Pick up Online Training Clients While Setting up Long Term Success. Pick up Online Training Clients While Setting up Long Term Success. Some methods to get new online personal training clients are quite short term in their approach, meaning you may get a few clients now but they won't help you grow your business long term. Here we look at some methods that will help you attract new clients right now but also form the foundations on which to build a more substantial online training business. Think of the former clients that left you because the cost was to high, because online training is going to be cheaper than face to face, and those that left because they had to move away, because online training is completely independent of location. Get in touch with them, let them know what you're doing and you'll find a few of them will want to sign up. Even if these former clients don't sign up with you they will now know you offer online coaching and may be very happy to recommend your services to family and friends. A lead magnet is something you give away for free in return for contact details of a potential client. Things that work well for online trainers are challenges, a free trial, or a sample program. Host the sign up on your website so a potential client can sign up and give you their contact details any time. After someone signs up to your free offer you can start to engage nicely with these potential clients. Show them your coaching, and get them into your world. 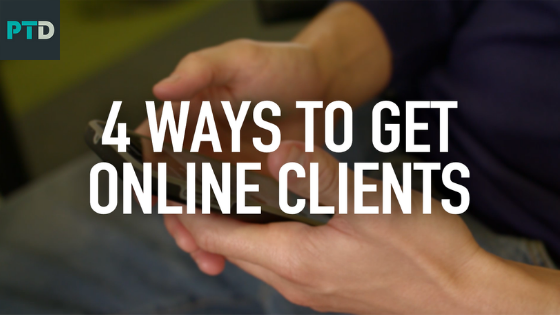 Here's how you turn someone on your free challenges into a paying client. Often you see personal trainers hold back on their free content so they're not giving away what they have in their paid programs. This is not the best way to go about it. Give away all of your best information and really help people understand what you're all about, how much you can help them and what you can do for them. The aim with free content is to build up trust and expert status. To be seen as an expert your information needs to be top quality. Your paid programs are all about implementation and structure, giving your clients the exact steps to get incredible results and helping them to take those steps. So with your content, you're giving away all of your best information and using that to build a relationship. Then you sell your paid programs as the best way to implement that information and guarantee great long term results. For guides to grow a huge online training business go through the PT Distinction University which is free for all members, and free trial members of the worlds highest rated personal trainer software.